Endless Waltz is a sequal OVA concluding the &quot;Gundam Wing&quot; series. It takes place a year or so after the event of Gundam wing and shows how the stability of the world has changed and how the main characters have grown and done with their lives after their roles as gundam pilots are over. But even though things seem to be going in the right direction of peace a new military organization rears their ugly head and want to mess things up. Story: It still holds onto that Gundam wing feeling, but with a faster sense of pace and scale. The reintroduction of the characters~ and transition between plots and battle are flawless. There is a higher feeling of &quot;emotion&quot; and drama than was in the original series~ possibly because the stakes feel alot higher. While there are still politics, because ova's are shorter they thankfully lessened its role in the story~ though there are several speeches it doesn't mess up the pace of the story as much. The epic battles and character development are the high points of this series. Sound: The sound still caries that &quot;90's&quot; anime feel...but it was toned down a little. Both the opening and OST were superior to the series. There's not much more that can be said about them if you've already seen the series, and I don't recommend you watch the OVA's before the series. But the only reason Gundam Wing is as popular as it is, is because the characters are very unique, fun, and developed. The OVA does show more into each of the characters past, and in the case of Trow~ his entire history is finally revealed. I'm a very picky grader~ but there is hardly any argument I can make against this OVA. 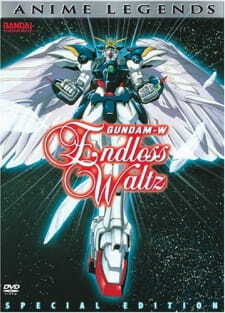 A sequel to the TV series, endless waltz is as good as the series. A Great conclusion to what was a great series. The animation is the same as the series and so is the sound and soundtrack. Although the story is not as strong as in the series the character evolution is. It is great to see what all the characters have been up too and what alliance have they taken since the war finished. Lots of confrontation between the main characters and a credible villain make this ova a must see. If you saw the series and haven&rsquo;t seen this yet, please do yourself a favor and see it now!!! In some kind of long-term masochistic exercise, I managed to watch all 49 episodes of Gundam Wing. I hated it. It's a near unintelligible series - the storytelling is utterly incompetent, character motivations vacillate wildly, the animation is poor, the drawings lack detail, the dialogue is embarrassing. Naively, I thought Endless Waltz would be a huge improvement over the television series. I was right in part. The animation is fluid and impressive, the drawings are more detailed, and the Gundam designs are really impressive. The OVA gives the characters some much-needed context, and the OVA clarifies the television show's themes of resistance against hegemony. But it's still a narrative mess (I thought Zechs Marquise wanted to drop a colony on Earth - now he wants to stop Dekim Barton from doing the same thing?). It's an improvement over the show, and it is definitely aesthetically pleasing and impressive. But the story is so incomprehensible and stupid, I couldn't bring myself to like it, no matter how hard I tried.